"We'll meet you back at the hostel to catch the sunset with a beer." Louisa said, securing the clasp of her helmet onto her head. Her hair, like mine, was still dripping wet and sparkling under the sun from the lagoon we had just been swimming in. "Sounds good!" Lewis and I said almost in complete unison, climbing onto our shared moped. We were in Vang Vieng in northern Laos - a backpacker-oriented town nestled on the Nam Song river. Our plan was to stay here for just a night or two to take in the beauty, visit a nearby lagoon and to experience the 'best nightlife' (according to other backpackers we had met) in Laos. This was our second destination in Laos so far after Luang Prabang (and only my third in Asia). We had spent the day at the Blue Lagoon, a stunning lagoon with bright blue waters that was definitely one of the biggest tourist traps we had seen in Laos. Before visiting Vang Vieng we had looked up things to do there, trying to prioritise favoured activities and attractions, and the Blue Lagoon was always at the top of everyone's list. While people crammed into the waters and queued endlessly to climb up the trees and jump and swing into the water (over-crowded was probably an understatement), you could still appreciate the sheer beauty and understand why every tourist and traveller wanted a slice of the lagoon heaven. It was a gloriously hot day and we had driven, by moped, around 20 minutes from the town centre with a couple - Jannis and Louisa - who we had met the night before and become friends with. Lewis and I had originally planned to get a tuk tuk from the town centre to the lagoon, however Jannis had suggested that a moped would be a cheaper and more fun way of getting there, so we agreed and went to a nearby moped rental. It was also something that both Lewis and I said we wanted to check off our South East Asia travels list. I had never ridden a moped before and neither had Lewis, which I actually didn't realise at the time (he had spent four months in South East Asia a few years before so I just assumed he had been on one). We agreed that Lewis would drive and that I would go on the back, jotted down the route to the lagoon on a piece of paper, and then we were off. The drive to the lagoon was fine; our first stop was a nearby petrol station where we filled up our tanks for the journey ahead. Although a bit shaky at first, Lewis got the hang of driving the moped really easily. We had to cross a bamboo bridge in order to get to the right road to the lagoon which was absolutely terrifying - it was the tiniest, wobbliest little bridge that felt like it was about five centimetres wide and held up by twigs. But we drove over it and made our way to the lagoon with no problems. Our way back, however, was a bit of a different story. We pulled out of the car park of the Blue Lagoon (yes, that is how much of a tourist trap it now is - there is a car park), and turned onto the main road. Jannis and Louisa were in front and the sun was just beginning to drop, cooling the air. We'd be back in perfect timing to watch the sunset. The first part of the journey was truly blissful; within a couple of seconds we were driving down a small fenced road that was wedged between endless green paddy fields on one side and dramatic blue-grey mountains on the other. It was absolutely beautiful. The air was warm and thick yet the breeze soaring through my hair and rustling my dress cooled me, and my mouth tasted of saltwater and beer. As Lewis settled into driving and I admired the stunning backdrop around us, we started chattering and singing along together. We felt so free - soaring through the countryside in Laos, neither one of us with any commitments or plans. Just us, hot weather and endless exploring. That's when a sharp turning suddenly appeared and before either of us could grasp what was going on, a voice (which I now realise belonged to myself) was shouting. We were skidding off the road. It's no lie when people say that accidents happen in blurry slow motion when you experience one yourself. It felt like we were skidding for minutes, gravel and bits of dirt flying everywhere, creating dense clouds of dust all around us. Of course it was just a split second. Lewis was desperately trying to regain control of the bike to make the sharp turn, jerking the handlebar left then right and trying to slam on the brakes. We were heading straight for a deep ditch under a spikey barbed fence, and seemed to be picking up even more speed as we skidded. As we entered the ditch, Lewis and I flew off the bike - which went on to crash into the fence. For the tiniest split second we both lay there in the dirt, and then the adrenaline kicked right in and we both shot up, asking each other over and over again if the other was ok. Out of nowhere three young Laotian boys, who must have been farming in the field, appeared with their hands full of green leaves. They can't have been any older than six or seven, and they proceeded to put the leaves in their mouths and chew them, before spitting them out and handing them to us. They were speaking in Laotian, desperately trying to communicate with us. One of them took the chewed up leaves and bent down, rubbing it on my knee. I felt a sharp sting and looked down and that's when I realised that my knee was a purple colour, covered in cuts, twice its usual size. I burst into tears as the adrenaline wore off and I realised that we had actually been in a bike accident. I noticed that Lewis's arms and hand were covered in deep cuts and scratches, his foot bleeding and the visor for his helmet was split in two. Two of the young boys got to work finding the broken pieces of our bike in the ditch and around the fence, putting them back in place. The other continued to give us the leaves and dab our skin with them. That's when I realised that they saw this kind of stuff all the time - tourists and travellers hiring out mopeds and crashing on the windy roads. They were even making money off tourists crashing - after helping, they signalled to us that we were to pay them for their help. In fact, we were later told that we were one of many who had crashed on that bend - and some came off much, much worse than us. We also later found out that the green leaves we were given by the boys, when chewed, helped to stop bleeding and makes the skin heal and grow back faster. Luckily, after a day or two of rest I was able to slowly walk and carry on as normal. The swelling in my knee slowly went down and we disinfected all of our cuts, keeping them clean and staying out of water. It still hurt for a while, but we were so lucky - some tourists have not been so lucky and have had serious and fatal injuries from mopeds. 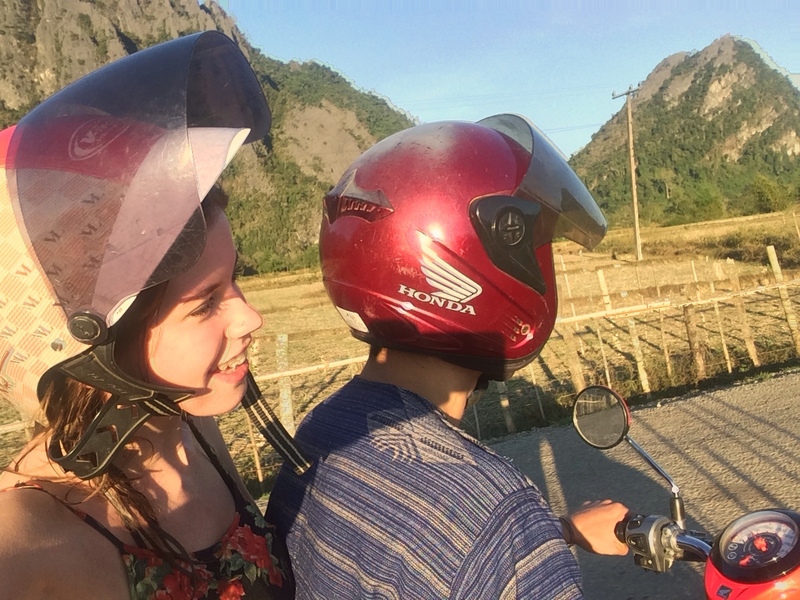 I wanted to write this post to basically raise a bit of awareness surrounding hiring out mopeds in foreign countries (particularly South East Asia, where it is seen as the 'must-do' on a travel bucket list). We wouldn't just climb on a motorbike and drive on main roads in the UK if we had not had a test, so why do we think it is ok to do it in Asia? The safety rules and regulations there are completely different (almost non-existent), and it just seems like the 'norm' to drive a moped around. The moped rentals are aimed at tourists, offering cheap alternatives to tuk tuks and taxis, advertising good deals and some even stating that it is 'part of the Asian experience'. Shockingly, moped and scooter crashes represent almost 70% of all road deaths in Cambodia, and the number is even higher in Laos and Thailand. If you have never ridden a moped or scooter before, now is probably not the time to learn. The roads can be very sharp and windy with no marks. Many roads are not maintained well. Try to learn before you go. Get insurance. It is so important! If you do end up in an accident or a collision, you could be blamed and end up having to fork out a lot of money - after all, some just see tourists as walking wallets. Wear a helmet. Obviously. We saw so many tourists and travellers zooming around on scooters without helmets on, but they are so important. It could be the difference between life and death. Although no drinking and driving sounds like an obvious one, you'd be so surprised. The rules and regulations are so relaxed in certain places in South East Asia that anyone can drive a scooter in any state - including to and from the clubs that shut at 4am. Do not drink and drive! Before you rent out a bike, check it once and check it again. Make sure that the brakes and lights work and make sure that the horn is loud and clear. I have heard stories of scooter rentals loosening brakes so that tourists crash and come back with a damaged moped, meaning they have to pay extortionate prices for damages. Take your time. Drive slowly. Just because the locals drive like maniacs (they know the roads well and you don't, remember), it doesn't mean you have to. Do not try to keep up with anyone - go at your own pace. I won't link them here, but all you have to do is type into Google to see the stories of how many lives have been taken by scooters. Stay safe and be careful! Have you ever rented out a scooter on holiday or while travelling? 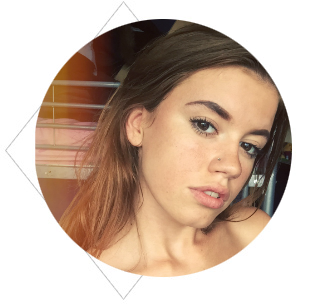 Such a great thing to share your experience to help out other people and make sure they stay safe! Oh wow what a great thing to share your experience and I am so glad you are OK, I guess so many people don't think about the differences in driving conditions. Jeez I can't believe this happens so often that they now know to make money off this! 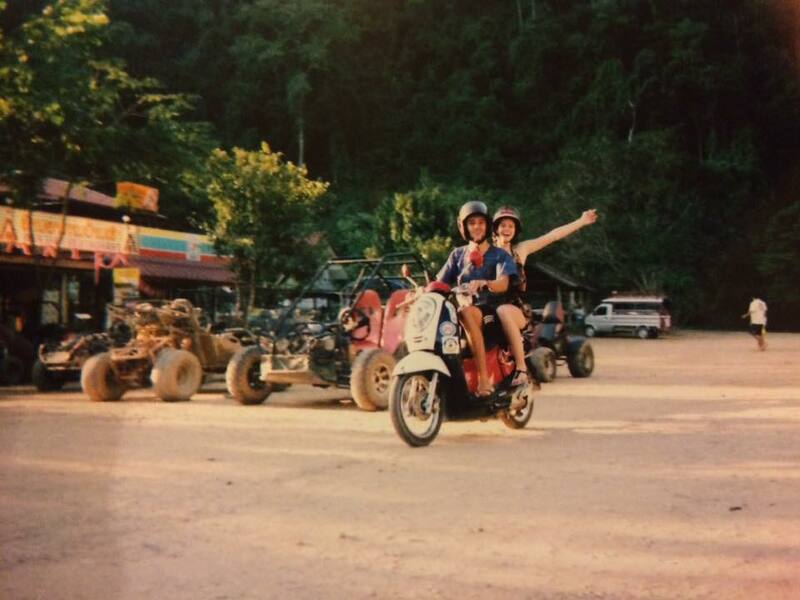 I rented a moped when I was in Thailand and was quite nervous the whole time but thankfully nothing like this happened. Glad you are ok now! So glad you were both ok, it must have been a very scary moment indeed! Oh wow, what an amazing adventure you had! I've never rented a scooter anywhere, but now I know what to do if/when I do! Oh wow that sounds really scary! I'm so glad you are both okay, it could have been so much worse! Sounds terrifying, glad you were both okay.So many people don't think about the driving conditions abroad and I've no idea why! I had exactly the same happen to me, a moped accident in Greece. We were lucky too although spent the rest of our time on crutches. Mopeds are so dangerous. Thank you for sharing your story. I'm glad that you only had minor injuries and thank goodness you were wearing helmets! My brother was in a horrific motorbike accident here in the UK and I would never get on a moped or bike after seeing his injuries. Scary stuff.